Since my last post on my design fantasy, Emily posted on her blog that her new show, Secrets From a Stylist (for which we are being considered), was just picked up for 26 episodes! This is great news because it means that the show will be sticking around for a while, unlike other shows from previous design star winners (cough… Antonio… cough). The problem we now have, though, is she also told all her readers to apply to be on the show. The application isn’t on the hgtv website anymore, but with her blog post, I assume more people will apply and that means more competition for us. Boooo… By the way, my dear loyal friends, if any of you apply and get on the show and we don’t, consider our friendship over. No, I will not be happy for you. I will be jealous and mad. She also wrote on her blog that she will be making over only one room, not the whole house like she did for Ian on her first special. I kind of knew this because the application asked us to talk about one room we would want to change, but I hoped for more because they asked for pictures and video of all the rooms in our house (minus the kitchen and bathroom). So… she would probably do our master bedroom because it needs the most help and that is the one we focused on in the application and these other fantasies will probably remain fantasies unless they decide to be super generous and surprise us with four rooms (man, that would be freaking amazing). OH AND ANOTHER THING… she wrote in this same post that the rooms “should be 15′ x 20′ or else amazing” and ours aren’t quite that big which makes me a bit nervous. I already sent the measurements and they have since bumped us up to the next phase, but I still worry that if they find something bigger and better they might give us the boot. Please nooooooooo….. 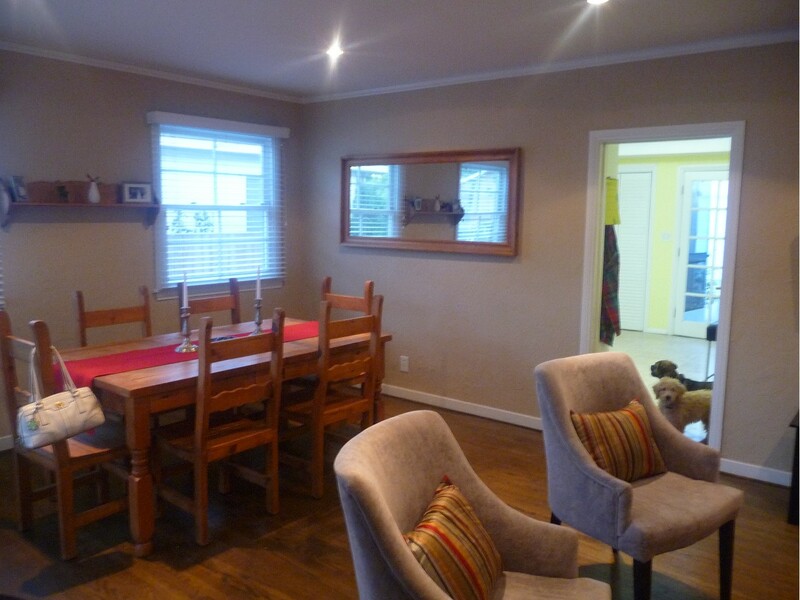 It is one big-ish room that we have tried to separate into separate living and dining areas. I actually like this room for the most part. I had planned on putting up curtains myself this summer, but since we are being considered for this show, I decided to wait until we found out for sure. I also really want a fake gas fireplace where the TV is (one of those that doesn’t need a chimney, but you just flip a switch and it goes “on” and gives off a bit of heat, but is really for looks and mainly so I can have a place in the living room to hang stockings at Christmas – you didn’t forget about me being crazy, did you?) and above the mantle, I’d like an indent in the wall to hang the TV so it doesn’t stick out. Oh, and a new TV would be awesome. This living room from The City Sage would be my favorite if I lived alone or with another girl. However, it is a little too feminine more my husband’s taste, I’m sure. 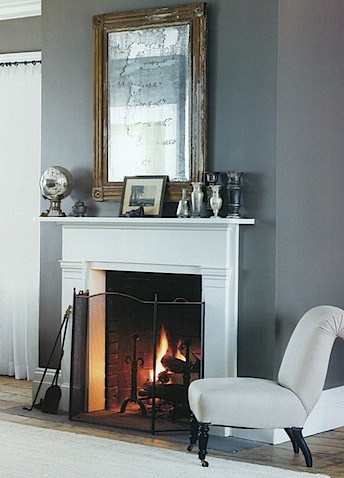 Here is an awesome fireplace, also from The City Sage, with my favorite new wall color: gray. I adore this mantle and the huge baseboards and the rustic wood floors. Another one from The City Sage. 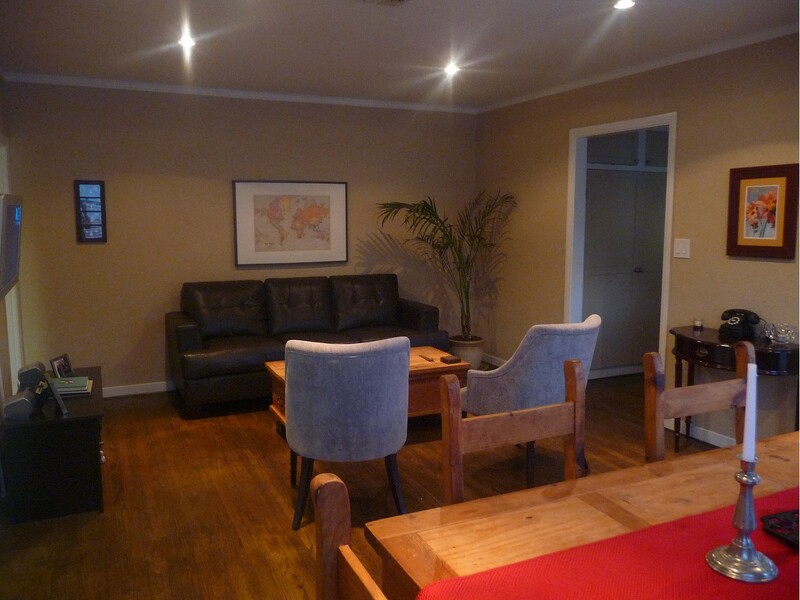 I really love the furniture – except the white couch because I’m much too practical for that. I’d like to see some color on the walls other than white, though. The more I look at design blogs, the more I see white walls as a huge trend and the rooms can be very beautiful. However, growing up always living in apartments and never being allowed to paint the walls, I feel like my walls must be painted some other color than white in order for me to be taking advantage of being a home-owner. 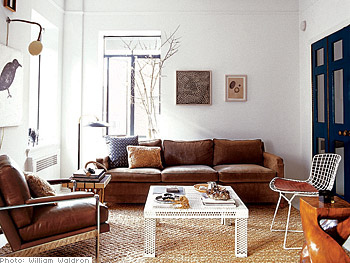 This one from Nate Berkus is effortlessly chic. Those stools are nice because they provide extra seating without taking up a lot of space. 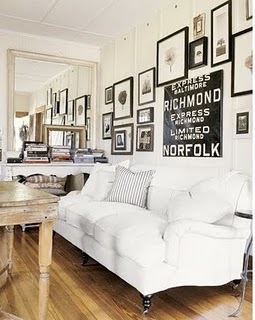 Another one from Nate Berkus, and another one with white walls, but I really like the couch and branches. This is almost too masculine, though. One more from Nate and let me tell you something: he uses that rug a lot. I don’t know how I feel about it. I like it in this space with the bright green accents, but I don’t think I’d want it in my house. What I really love about this room is that it doesn’t feel like everything is new and mass-produced. There is a sense of unique-ness to the furniture and accessories which is important to me. I never buy art from stores that have 10 copies of the same thing sitting there. I like things are are original and different (without paying thousands or millions for an original painting by a famous artist). I’ve loved gallery walls for a long time. I have a mini one in my hallway now, but I didn’t really put a whole lot of planning into it. I’d love one with more pizazz like this, from The Brass Petal, in our living room. I just read somewhere that purple is out, but I just sort of noticed it recently. I almost bought some dark purple curtains at Ikea for our living/dining room and was going to make pillow covers to match. This lovely “aubergine” room, as Emily (of The Brass Petal) calls it, is maybe a bit over the top for us, but I like the idea. 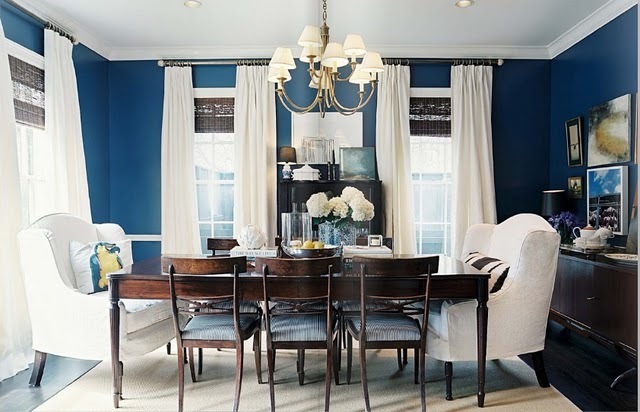 Now for the dining room inspiration. 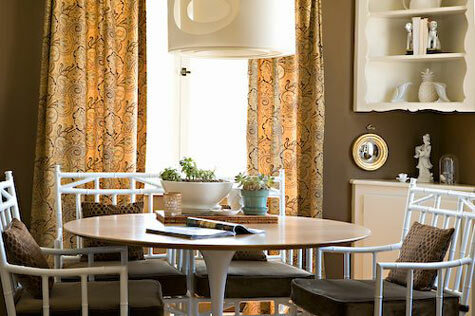 My favorite part of this dining room from Design Sponge is the corner cabinet for china and linens. I never really thought about something like that for our space, but now that I see it I think it would work really well. 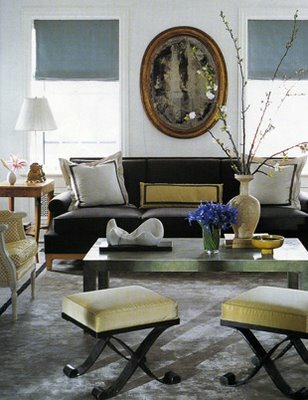 While that paint color scares me, I think this room (from The Brass Petal) is so gorgeous. The window placement and size of the room are almost exactly like ours. I’ll take it. 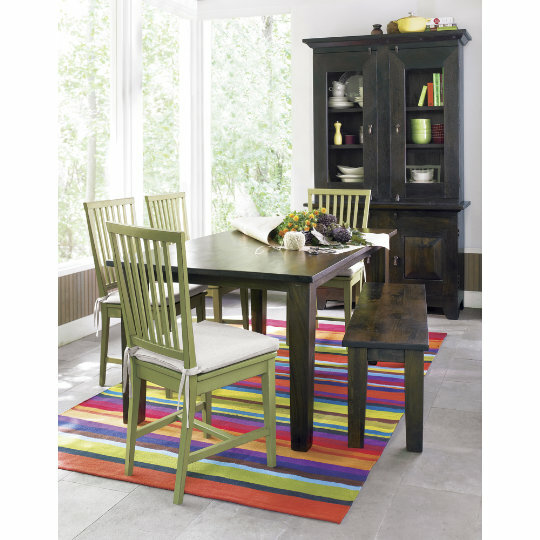 This dining room from Crate and Barrel is bright and fun, but practical. I love having a bench on one side so more that two people can sit down. There’s that gray again. Love the white sheer tablecloth, as well. This room is from The City Sage. Coming next…. Design Fantasy: Master Bedroom (the only room that I should even be thinking they’ll redecorate). ← Design Fantasy: Guestroom… or not. all this planning something good has got to come out of this!!!! More like "all this daydreaming" – I'm not really planning anything, just fantasizing. If we don't get the show, at least I have some inspiration for when I win the lottery! Oh you should definitely paint the office grey!! Let me know if you convince him!